happened to be on my horse. and walked around the ring. After a few minutes of indescribable bliss, I was trotting around. certainly given me more passion to get back to it than I knew I had. could just be with my horse, just jump a few more fences. These thoughts made me feel immensely guilty. when I was on my horse, with my horse, or thinking about my horse. importantly, I had to LET GO OF THE GUILT. professional help right away. You are not alone. Make an appointment with your doctor right away. any sort of rebuttal or debate. They won’t coddle you. They will just teach you to “BE”. start to feel more like yourself again. Accept your emotions, whatever they are. yourself and your feelings, things will slowly start to fall back into place—even out of the saddle. 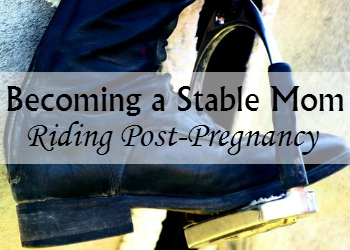 You CAN be a stable mom, even when you aren’t at the barn. she and her husband welcomed their first two legged (human) son into the world. 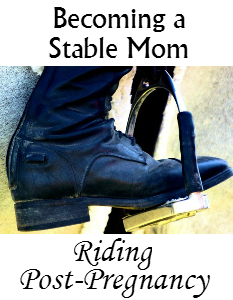 mother with her lifelong passion of staying in the saddle.